Happen to catch this video one day, and they were at it for around 10 minutes before I decided to seperate them by hand due to a predator eyeing them off. You will see that one hermit even left his shell to fight, quite unusual! Just noticed that my Blood Parrots were a lot brighter than usual the other day. 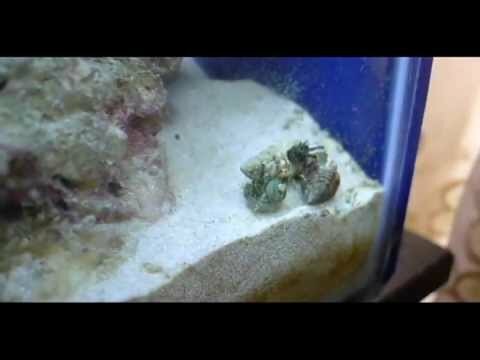 I looked into the tank, and I noticed little white eggs on the pebbles they like to rest on. I heard it is extremely hard to get these guys to breed, and their eggs are mostly infertile. I took some photos to post up here just in case anyone else was curious. The shots are a little blurry, so I’ll have to try again next time!